I don’t really consider myself to be a baker, but I really like cooking in the kitchen. Decorating a perfect looking cake is an art form that I just haven’t mastered, so please don’t judge this Zucchini Cake based on the looks alone, because the flavor is SO GOOD! You could even bake this cake in a loaf pan without any frosting and eat it like a Pound Cake too and that would even be perfect. 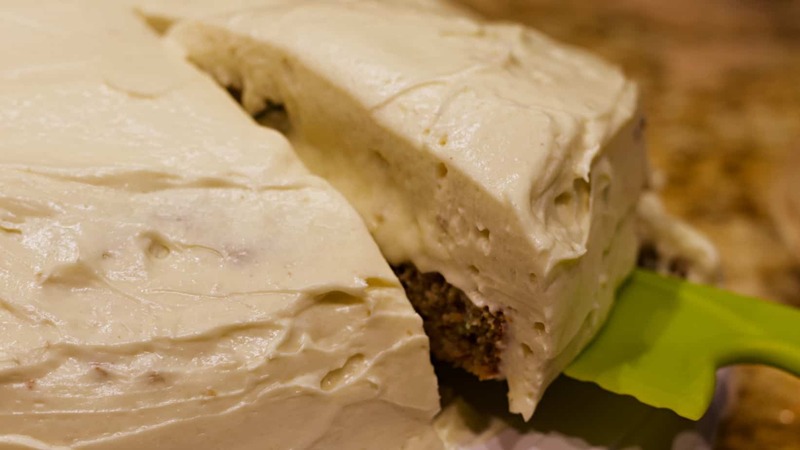 It has just the right combination of spices and fluffy cake texture, you wouldn’t even know that you were eating something that could be considered Low Carb. I got the inspiration because one of our favorite cakes at home (aside from Cheesecake!) is a good Carrot Cake. Seeing as how we aren’t supposed to eat carrots while trying to maintain ketosis, it seemed natural to bridge the gap between Zucchini Bread and Carrot cake and make a “Best of Both Worlds” type of attempt. 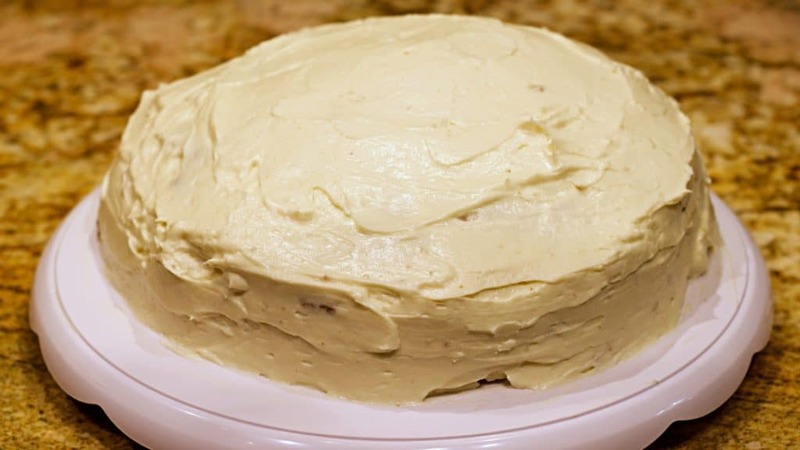 I sat down and looked at my traditional carrot cake recipe and figured that I could make some easy substitutions for the Sweetener, The Carrots, and the Flour and that would make this cake pretty on-par with what most people would consider Low Carb or Keto. You can use a different brand of sweetener on the cake or the frosting if you want to, but just be sure to pick the brand of sweetener that you like the taste of before you commit to putting it into a cake. We use different sweeteners in this house for different things, from sweetening our coffee to making cheese cake, or baking a cake. Just to clarify, approximately how many ounces or grams of zucchini is called for, and is it shredded similar to the carrot cake? Yes, you shred it just like making a carrot cake. I think once you’ve shredded it you will use about a cup and a half to two cups. Sorry, I did not weigh it. But I could weigh a similar Zucchini and find out soon. How many cups IS one-half of a large zucchini? Recipe confusion! The recipe states HALF a zucchini, but in the comments 1.5 – 2 cups of shredded zucchini is mentioned. what is the difference between monkfruit sweet and golden monkfruit sweetener? The Golden version is like a light brown sugar. That is all. Is golden Monkfruit necessary or can I use regular for the whole thing? You can make it with regular monkfruit too. We just like the brown sugar flavor that the Golden Monkfruit provides a hint of. Yes, but I would personally avoid Stevia since (to me atleast) that comes out bitter after baking. I use Truvia as my sweetener, do you happen to know the exchange amount I would need to use? The sweetener we used measures equally to sugar. Truvia themselves do NOT even recommend baking with their own product, unless you use their baking blend, which contains 25% sugar in it. I ues brown Splenda very little. Is this okay. Read about what Dr. Gundry has to say about Splenda. I won’t consume it based on what he’s saying. I won’t give it to my family. Between your two choices I would go with Erythritol. If you use this much Stevia the cake might become bitter. I read in the comments that the zucchini is grated or shredded. It is to be added with the WET ingredients??? That ingredient was left out of the entire recipe. That’s the result of me staying up to 1am posting a recipe online. Thanks for pointing out the oversight. I added that step in! I ahve never heard of Monkfruit. Where can I get it? I hyperlinked the words to Amazon so if you click on the sweetener name it can take you there. Otherwise I have had luck buying some at Sprouts Grocery Store near my house. If I use Erythritol, will it be the same equivalent as the Monkfruit? Monkfruit is equal to sugar in measurement so use the erythritol equivalent as sugar. I’m allergic to eggs. Have you ever tried making this with an egg substitute. No, I personally haven’t. But I do have a Vegan friend who makes Flax Eggs and bakes almost everything that way for himself. Something like that might work. Can’t wait to try this recipe. Can I substitute the coconut flour for almond flour? Yes, but you will need to look up the conversion of it and feel out the texture of the batter for yourself. Did you use coconut flour? How much? & did it turn out? Yes, I used Coconut Flour, and it turned out Glorious! I am glucose and lactose-free. I can’t wait to try this as a pound cake. As I see it I got two recipes for one because I can use the same recipe and use 1 1/2-2 cups of carrots and have a carrot cake. I use coconut and pineapple in my carrot cake. I think I will play with incorporating both when I try making the carrot cake. Thanks for sharing this recipe. I also LOVE Pineapple Upside Down Cake, if it werent for there being no substitution for pineapple that I can think of I would so be looking to make one of those keto-friendly too. I know this wouldn’t substitute pineapple, but what about a berry upside down cake? With fresh berries on the upside down? ???? I made the zucchini cake and it was delicious but the bottom is white. Like the oil maybe settled to the bottom. What did I do wrong. Did it only turn white AFTER you refrigerated it? If so, that might just be coconut oil solidifying, which to me would mean that maybe you added a little too much? No harm though, as coconut oil is very good for you. Also, if you refrigerate the cake as directed with the leftovers, you can warm the slices up a little before eating them to make them nice and warm. Same thing happened to me. It was like a gelatinous off white color not the bottom and the whole thing was extremely oily. I used the indicated amount of coconut oil but man, it seems like a lot. It wasn’t after it cooled either. Looks wonderful! Did I see correctly that in the video 8 eggs were used but in the written recipe only 5 eggs are listed? The video shows 8 being used, which 2 more were added off camera to make the texture the way I wanted it after mixing (video shows a double layer cake). The recipe is PER LAYER, because I figured that most people may not want to make such a large cake. I see your Keto cookbooks for which I am interested. However, is this for an actual hardback book? Or is this offer for an on-line download? I got took before paying for what was shown and advertised as a physical hardback book, but ended up being just a download. My dollars taken and of course no response on the inquiries I submitted. Laura, I do not sell a cookbook yet. Perhaps those are ads that Google puts on my site that you are referring to? I am definitely going to be making a cookbook of my own in the near future though! Avocado Oil, Melted Butter, or similar. Hey, This cake sounds marvelous! They would probably cook up a bit quicker. Don’t have exact details for you on that yet. Looks wonderful! My cousin is allergic to coconut, could I substitute it with oat fiber? I baked this cake tonight and it is cooling. I am so excited to try it! I thought I had cream cheese and of course I didn’t! I did have mascarpone cheese and used that instead! The icing tastes divine! Thank you for such a yummy looking recipe! Marscapone sounds like it would taste even better! I made this cake last night. I’m wondering if I might have undercooked it? It is a bit oily. Would that be the reason or is it just oily due to how much oil is in the recipe? It was firm just oily. Ours generally turn out what I would call “moist” but not oily. Perhaps not cooked quite enough? I made the frosting as directed and it is very grainy. Is there anyway to prepare this recipe so that the monkfruit sweetener isn’t grainy in the finished product? Usually it’s grainy after refrigerating it, so we warm our slices up. You could also opt for powdered monkfruit sweetener next time you make frosting. We have trouble finding the powdered version in our local stores, so we have had to buy it on Amazon or directly on their site so far. I often blend my granular sugar subs w/a pinch of cream of tartar & make my own powdered version. Then, no grainey frosting ! You may want to powder your sweetener. I have put mine in a blender to powder it. Some people use coffee or spice grinders to powder theirs. I assume it would be good to measure the sweetener first then powder it and use it that way. The volume could be different from one form to the other. I used powdered Monkfruit and it was not grainy at all. Powdered does work best. It’s harder to find in stores though. I just made the cake. I had to bake it an additional 25 minutes, which is unusual for our oven. At the initial 20 minute mark, the batter was still runny. It’s done now, and it looks and smells great! Good thing you followed your instinct on that! I bet that kitchen smells fabulous! You need to check that ! Also, it just occurred to me that there are different types of coconut oils too. I’ll have to look at the kind I have )got it from Costco). Cook the cake until a toothpick comes out clean from the middle. It should turn out delicious, and I am sure your kitchen smells amazing from it too. And yes, sometimes I make that frosting on its own to get more fat in for the day in a very tasty way! Do you melt the coconut oil and measure. Or measure it solid… Thank you. I poured it as liquid, as it melts at most room temperatures, so you could say that I melted it. If you are still able to use the sweetener you could attempt to make a simple buttercream with powdered sweetener and butter. When I made the cake; I used almond flour instead and the cake had to bake over 40 minutes and was still too moist in the bottom. I pulled it out because it was getting too dark on the top. Would exchanging the coconut flour to almond cause this to happen? When you switched to Almond Flour did you triple the amount of flour compared to the coconut flour? Almond and Coconut flour exchange for each other at a 1:3 ratio. Hi! I pinned this keto cake from your blog but when I went to open it in Pinterest, it said it was blocked due to spam. This site is obviously not spam but looks like they have blocked/hidden you. Just letting you know so you can contact them to make you public again. It’s usually due to posting the same pin in multiple group pages. Hope this helps! Hi, we are currently working out this issue with Pinterest. Apparently their system thought that the unusually high number of pins coming from the site were a sign of spam. They didn’t realize that lots of people actually just wanted to save the recipes to their Pinterest Boards for later. I’m making this cake now and I added raisins. I know we aren’t suppose to have them but a once and awhile treat is not so bad! Do you have other recipes you can share? Shelley, I post recipes every day or every other day on here just about. I will keep adding more! Hey ! I’m not a huge baker. What vanilla flavoring did you use ? Vanilla extract ? Hey ! What vanilla extract did you use ? Can Swerve sweetener be used in place of the monkfruit the recipe calls for? I would use granulated for the cake and confectioners for the frosting. Advice? Confectioners for the Frosting is the best choice there. I haven’t baked it with Swerve personally. I’ve baked a few things with Swerve and those all turned out to have a bitter Stevia flavor when there was a lot of it used. Plus, The Golden Monkfruit is like a brown sugar which gives the cake some flavor. Does Swerve make a brown sugar too? Tjanks for your wonderful recipe. I used Swerve and Swerve confectioners for icing and turned out great. I bake with Swerve a lot and remain strict keto. Swerve is made of erythritol and has No Stevia, so is never bitter! Hi. I can’t wait to try this recipe. Do you think I could make this into cupcakes instead of a cake? This way I can freeze them and take them out when I want them. Cupcakes would probably be even easier. I made this cake and it was runny and wouldn’t cook all the way through. Way too moist. Why does the video show 8 eggs but the recipe calls for 5? It’s like watching a video of one recipe and then making a different version of it? I’m baking the cake now and followed it measurement for measurement but mine still came out runny looking compared to your video. Looks yummy , will definitely try it. Can you tell me what can be substituted for Zucchini? It’s not available in our place. Thanks. I can’t wait to try this. But if you get a chance, if you figure out the time for cupcakes, please amend the recipe to include baking time. I love you recipes! Can’t wait to try this.